That’s why, when it’s time to say goodbye in the present, it’s often helpful to draw on the vast eloquence of the past. In times of great change, it can be hard to find the words to express the strong emotions we feel and/or sum up a period of college life that’s coming to a close. The Faculty of Allied Health Sciences, SGT University organized a Farewell Party for the students of Batch 2014-17 on 29th April 2017 at Examination Hall, 4th Floor, C-Block. Dr Kamlesh Kohli, Director, Medical Sciences addressed the students and wished them. Dr V.K.Govila, Dean, FAHS motivated the students with his motivational speech. The programme started off with the energetic dance performance given by one of the 3rd year students of Radio-Imaging Technology. This was followed by another power packed group dance by the students of Nutrition & Dietetics. 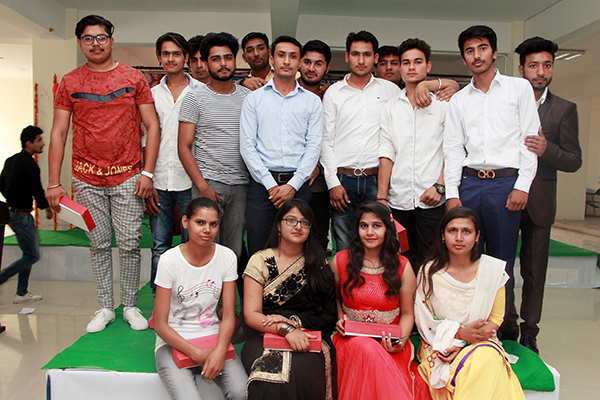 A ramp walk was also organised with a question and answer round mainly to assess the outgoing students on their ability to entertain the crowd as well as their personality development in these 3 years. Mementos were also given to the outgoing students as a token of love and remembrance. There were few indo western and duet performances which were thoroughly enjoyed by the both faculty and students. At the end based on their overall performances Mr. Rohit,B.Sc RIT 3rd Year was given the title of Mr. Farewell, Ms. Anjanpreet Kaur, B.Sc RIT 3rd Year was adjudged as Ms. Farewell. The title of Ms. Personality was given to Ms. Gunjan, B.sc Nutrition & Dietetics 3rd Year and Mr. Personality went to Mr. Navdeep. Students had a blasting time. They also shared their memories.